The Rolling Stones Song of the Day is We Love You. We Love You was written by Mick Jagger and Keith Richards. It was released as an A-side single the b-side was Dandelion- they certainly didn’t ask for my input but it boggles my mind why these two songs which were recorded in the summer of 1967 were not on the Their Satanic Majesties Request album- they sure would have added much needed quality to the album and would have fit in. We Love You as a single peaked at #8 in the UK- but in the US wasn’t very successful- #50. When I think of the song the first thing that comes to mind is John Lennon and Paul McCartney appeared on the song- as back ground singers- kind of a return favor for The Rolling Stones appearing on the All You Need Is Love – Our World telecast. 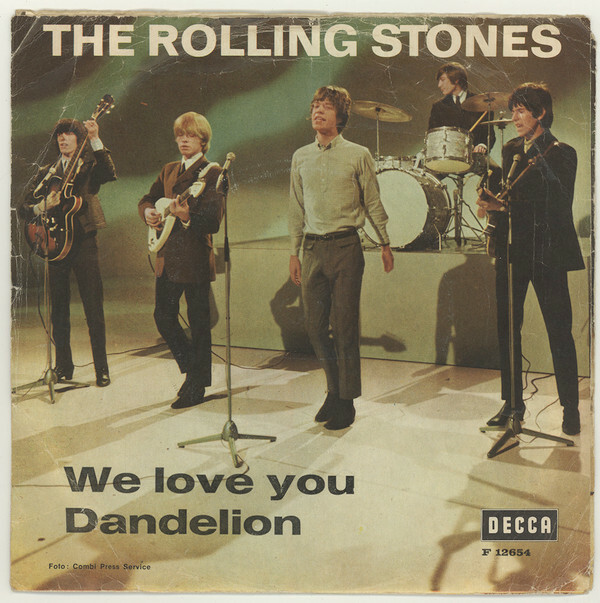 We Love You- The Rolling Stones contribution to The Summer of Love. The Rolling Stones had gone through some tough times in 1967 with the drug arrests and the song does have an anti-establishment sentiment to it. Brian Jones note- his mellotron on this song- is the most distinguishing part of the song- some consider this the last great contribution he made to the band before his fade away and death. They should have been on the album. I’ve always liked the video…I wonder if Brian had any say on those unflattering video shots of him. While it’s a bit of a weird song, I’ve always liked it. And, yes, it would have been a perfect fit for the album!